Free parking in lot on site. 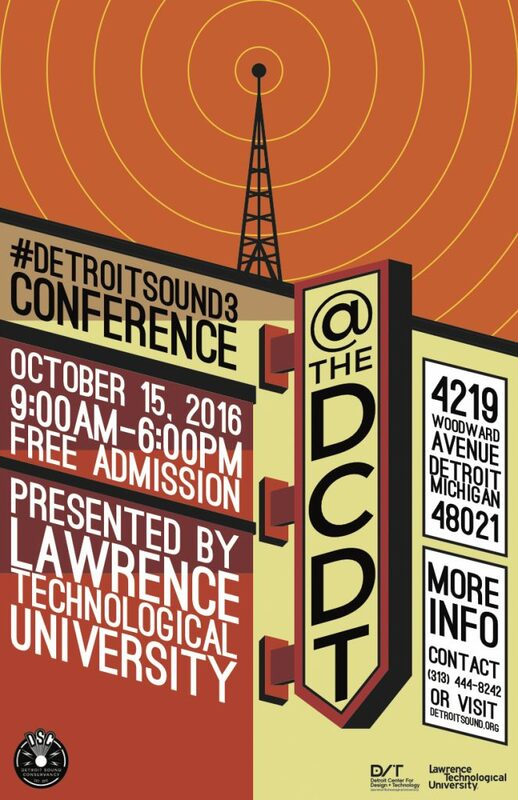 Detroit, MI: The Detroit Sound Conservancy (DSC), a non-profit organization dedicated to preserving and promoting the region’s sonic heritage, will host its 3rd Annual Conference on Saturday, October 15, 2016 in Detroit from 9 am to 6 pm. The all day event will be free and open to the public. A Fundraising Concert will follow in the evening and a Remembrance Ceremony on Sunday. This year’s conference will coincide with what would have been the 100th birthday of James T. Jenkins (1916-1994) the founder of the Graystone International Jazz Museum and Hall of Fame. Beginning in 1974, Jenkins and the Graystone Museum built an astonishing array of Detroit jazz artifacts, programmed numerous concerts, and educated both young and old on the importance of music for Detroit’s future. As the inheritor of the Graystone Museum’s artifacts and legacy, the DSC has planned a conference filled with interdisciplinary conversations between scholars, artists, archivists, activists, journalists, urban planners, and business leaders interested in discussing the ways in which Detroit’s musical heritage can be protected, presented, and activated. This year will also feature a pop-up Detroit music museum and the first annual James T. Jenkins Memorial Lecture which will be given by soul singer and activist Melvin “Detroit Soul Ambassador” Davis. A fundraising concert entitled DSC Sessions, presented by Audio Rescue Team and sponsored by Party Store Productions will follow the conference at St. Matthew’s & St. Joseph’s Church (8850 Woodward Avenue). A remembrance ceremony for Mr. Jenkins will be held on Sunday, October 16th at Woodlawn Cemetery (19975 Woodward). Video capture and production for all events sponsored by hawkhaus. RSVP + DONATE for Conference here. Purchase tickets to concert here. Times and speakers subject to change. Sponsored by Grand Trunk Pub, Golden Wheat Bakery, and Roasting Plant Coffee. Featuring artifacts from Detroit Sound Conservancy, Detroit Historical Society, Graystone International Jazz Museum, Michigan Antique Radio Club, Northern TV & Vacuum, Voice of Music, Voom, WGPR-TV Historical Society and more. An “Open Masterplanning Session for the North End” led by ONE Mile / D.A.M.I., Detroit Sound Conservancy, SDG Associates, and DetroitWiki. More info via DetroitWiki here. Meet at 10 am at cemetery office.